No matter the occasion, it's made even better with a slice of cake. This Yogurt Cake is an everyday cake. It's one that I serve as a weekday dessert or when friends come over for coffee. It has a wonderful dense and moist texture and tastes of almond, lemon, and vanilla. No one will ever guess how easy it is to make. This cake contains ground almonds. You can either buy almond meal/flour or else you can make your own by placing whole or sliced almonds in your food processor and processing them until finely ground. Almond meal/flour can be found at some grocery stores or else in specialty food stores, health food stores, or online. For the yogurt, I normally use whole milk plain yogurt (Greek style) as I like its rich and tangy flavor. This cake is excellent plain, but you can also serve it with fresh fruit and/or softly whipped cream. Another idea is to pour a Lemon Glaze over the cake once it has cooled. To make a Lemon glaze place one cup (120 grams) of confectioners sugar (powdered or icing sugar) in a small bowl. Add between 2 to 4 tablespoons freshly squeezed lemon juice and stir until you have a thick and smooth glaze. Pour the glaze over the top of the cake, allowing it to drip down the sides. Let the frosting dry before covering and storing. 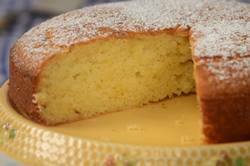 Yogurt Cake: Preheat your oven to 350 degrees F (180 degrees C) and place the oven rack in the center of the oven. Butter, or spray with a non stick vegetable spray, an 8 inch (20 cm) spring form pan. Line the bottom of the pan with parchment paper. In a large bowl, stir or whisk together the flour, ground almonds, baking powder, baking soda, salt, and lemon zest. In another bowl, stir or whisk together the eggs, oil, yogurt, and vanilla extract. Stir in the sugar. Add the wet ingredients to the dry flour mixture. Stir until just combined. Scrape the batter into the prepared pan. Bake in preheated oven for about 40 to 45 minutes or until a toothpick inserted into the center of the cake comes out clean. Remove from oven and place on a wire rack to cool. You can serve this cake plain or with a dollop of whipped cream, ice cream, or lightly sweetened yogurt.